There was a time when it was essential for upper and middle class women to be able to dance. Hard to imagine now, but for most of the 18th century European society would know exactly what was expected, and more prosaically where to put its legs, if the band struck up a bourée, or a rigaudon, or a forlane, or half a dozen other dances. There were dancing teachers, of course. In fact it was not an uncommon profession, for the demand was urgent. They had to be able to play the music and demonstrate the dance steps. This required a small instrument; in fact a pocket-sized instrument. It was also necessary for it to be very quiet: houses were crowded, and not everybody needed dancing lessons. The Dancing Master’s Kit, or Pochette, fitted the bill perfectly. The strings are roughly the same length as those of a violin, and similarly tuned, so any fiddle player can use it. Having such a tiny soundbox means it can never be noisy. The term “Kit” tends to be used by the English: “Pochette”, a French word, was used in mainland Europe. In modern usage pochette can mean a wallet, but it’s any small pocket. Inexplicably, there was a rush of fakes that flooded the market in the 1990’s. They were superficially convincing, but were generally easy to spot because the details were incorrect and because of indifferent workmanship. This isn’t one of those. Incredibly, the very narrow purfling around the edge of the table is not painted on, but is actually inlaid. It’s just a single strip, but it really does protect the front from creeping edge cracks. The back is in two pieces, which is rather unusual. Such small instruments tend to have one-piece backs (the fakes always do) and quite commonly the backs and sides are all carved out of one bit of wood. The back here is of beech, with an obliquely-cut knot at the bottom. Because the two halves are matched the knot appears heart-shaped. There’s a repaired crack through the knot, because it’s structurally weaker here and because this is, after all, perhaps over three hundred years old. This has proper ribs, and they are of plainer beech. The table is of wide-grained pine. Neither the front nor the back have any overhang: they are flush with the ribs. Well of course they are: there’s less to get snagged when taking it out of a pocket. The ebony fingerboard is of a later date, but the ivory saddle and end-pin are probably original. I’m unhappy with the pegs. They have what looks like teeth-marks on them. This is perfectly OK. When pegs become hopelessly jammed people do sometimes use their teeth to grip them, but these marks are too regular, and look intentional. The pegs are later. Now . . . where did it come from? Pochettes were made all over Europe. It isn’t English. It’s festoon outline discounts that, as do the soundholes and head. At first the head looks French. 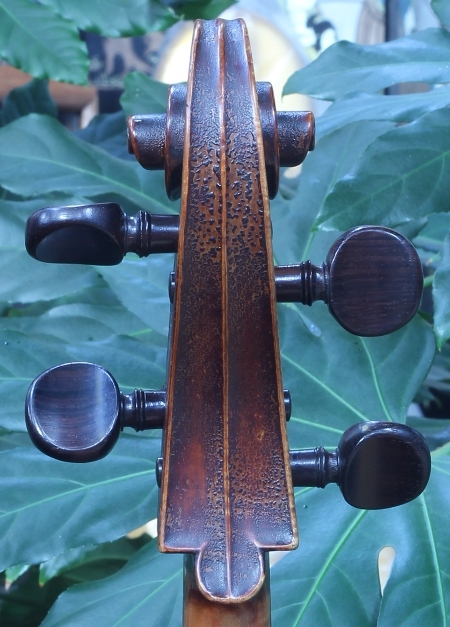 It’s an odd mixture of adult hair-do with baby’s face, and similar finials can be found on some pardessus-de viole and larger viols, also quintons and occasionally violins. However most of these have running decoration along the outside edges of the pegbox, whereas this is plain. Some makers from Prague made similar finials – Hulinzky, for example. I’m sure it’s not Italian. Italian pochettes tend to be of the straight-sided variety, and their pegboxes are not like this. I don’t think it’s Flemish either. I suppose there must be exceptions, but I’d expect a Flemish pochette to have soundholes shaped like the letter C.
I reckon it’s Bavarian. The varnish looks Bavarian – Augsburg perhaps, or Nuremberg. The soundholes are squeezed within the outline, but being vaguely flame-shaped are more likely from there or from further east, for example Vienna. These soundholes are quite strongly similar to those of a maker called Ernst Busch, who worked in Nuremberg in the mid-17th century. Well, perhaps it is that old. Also the very architectural tailpiece, which I think is pearwood, may well be original and is, to my eye, more Germanic than anything else. 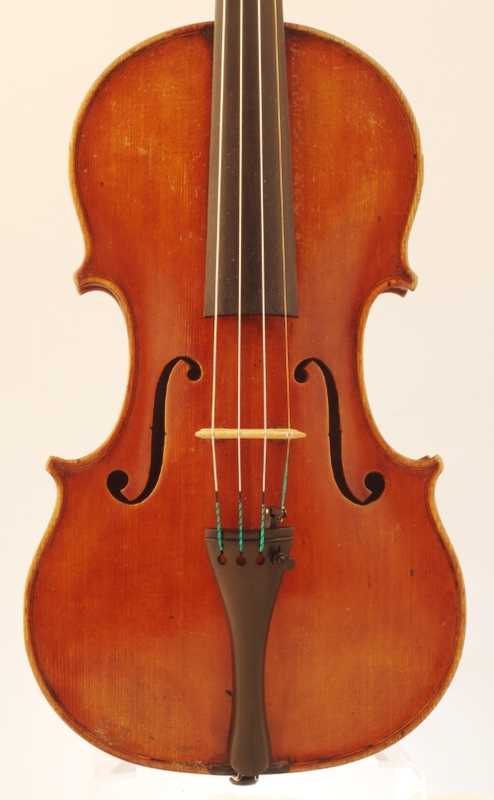 This violin was made in 1899 in Strasbourg, but in some ways it could be considered English. The maker, Georges Fillion, was born in France (in 1869) and was initially trained in Mirecourt. He then worked briefly in Switzerland and Paris, but most importantly London, for the firm of W.E. Hill & Sons. The beautiful Hill instruments dating from just before the end of the 19th century were made by French-trained luthiers: Charles Langonet, Joseph Maurice Somny and Georges Fillion seem to have been the best of them. There was a golden period around 1895 when all three were in the same workshop. However there were other Frenchmen too: Delunet, Marchand, Frelainet and Jenin . . . that’s seven Mirecourt-trained luthiers working for the British company. The Hills pursued excellence in their restorations and their products, and Fillion was very proud of having worked for them. He left the Hills in 1896, settling in Strasbourg. However some of his violins were clearly aimed at the British market and were sold in London. The labels of these are in English and bear the words “Scholar of W. Hill & Sons”. The label of this particular violin tells us this is No 58, dating from 1899. It is also inscribed 1er Qt, meaning first quality. He only did this if he thought it deserved it. The later example illustrated in Réne Vannes’ Dictionnaire is inscribed 2nd Q. This violin is unmistakably Irish. It’s very like an instrument by Thomas Perry of Dublin, or of his cousin James Perry of Kilkenny. 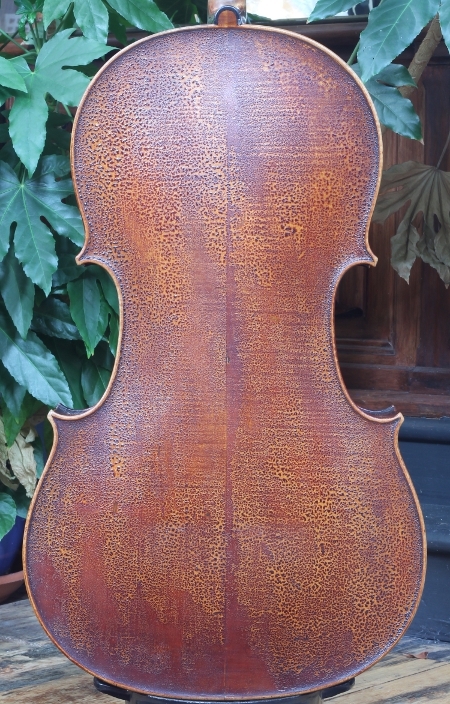 It’s unpurfled, and broadly similar to much English work of the late 18th century, except internally it has the tiny corner blocks usual in Irish violins, and externally the soundholes are very distinctive: the bottoms look too large for the tops. The decoration, however, is different. Apart from the scrolling foliage around the edges it has good signwriting on the ribs: Ni regret du passé ni peur de lavenir. Also, within a cartouche under the tailpiece is the legend Au Diable la Tristesse. Gung-ho stuff. It’s tempting to think that this violin might have belonged to an officer in Napoleon’s army. In the 1790’s there was a considerable effort by the French to liase with the Irish to join them in a war with England. After a failed effort in 1796, the French successfully landed around 2,000 men in August 1798 in County Mayo in the north west. Joined by 5,000 locals they quickly defeated the English at Castlebar and set up a short-lived “Republic of Connacht”, only to be defeated in turn within a month. The French prisoners were swapped for returning British prisoners of war, but the Irish officers were hanged. The back is painted neatly with the initials JWJ. There were seventeen Napoleonic generals with the initials JJ, where the middle initial is unknown, and one with the initials painted on the back of this violin: JWJ. There must have been correspondingly more colonels, majors and lower ranks. W is an unusual initial for a Frenchman, although not impossible, but quite common for a Belgian. 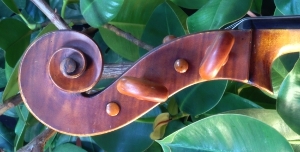 Here’s a lovely cello by Thomas Kennedy. 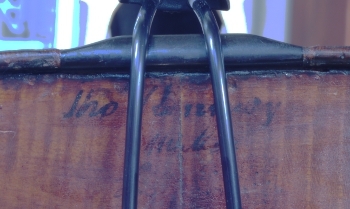 It dates from 1820, and, as well as having its proper label, it has Kennedy’s handwritten and dated inscription both underneath the front and inside the back Now, there are lots of cellos by this maker, so what’s special about this one? Its condition. The table has a small, repaired soundpost crack – well of course it does – and other unimportant shrinkage cracks here and there. The photo of the underside of the table shows their extent: I don’t think you can see them from the outside. But now . . . the back has no cracks at all. The ribs have no cracks at all. The head has no damage at all. The pegbox is unusually clean, and the pegholes have not been rebushed. The neck and pegs, by the way, are original. The table has not had any re-edging, or half-edging, anywhere. The varnish is untouched, and almost completely unworn. It has a very slight craquelure, but that just goes to show it’s correct. It has its original label: Thos. Kennedy, Maker, 364, Oxford Street, London, and also the original inked inscription, by the end-pin, is perfectly legible. There’s nothing wrong with the size: the body is 763mm (30 1/16in. in old measurements) and the widths are 341mm, 239mm and 442mm. The string length is 692mm. It’s probably as perfect a specimen as can be found anywhere. This blog is simply a link to an advert of mine that will appear in the Galpin Society Journal next year. It’s self-explanatory. Please click here. help for parents . Category: Uncategorized | Comments Off on Baroque! 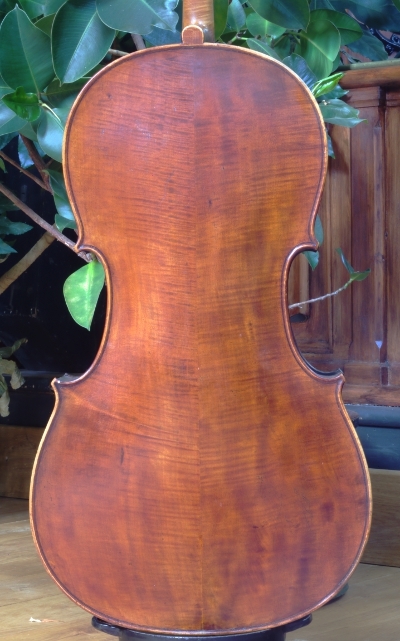 In the spring, I and a friend purchased, at auction, a cello catalogued as by Thomas Dodd. It looked awful, being filthy and having a thick coating of varnish that had become very crazed with age. Before the auction it was downgraded to school of Dodd. But I just loved it. Under the grime was a really classy cello in remarkably pure condition. We paid over double the top estimate. After the sale, when it had been paid for, I asked the auctioneers to put me in touch with the previous owner: after all, there’s no point in maintaining secrecy about these matters when the deal has been done. I thought that such a fine cello simply must have a story behind it. 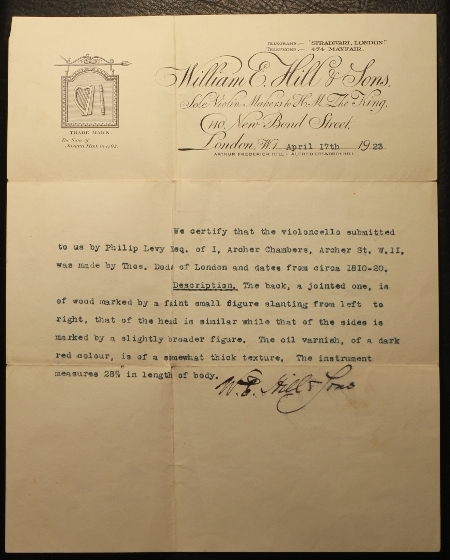 Sure enough, in due course, the original owner gave me the 1923 Hill certificate that they hadn’t considered important. Now, the certificate is fine as far as it goes, for nobody could doubt that the cello is by Thomas Dodd. There again, Dodd had people working for him, and it should be possible to do a bit better than that. After all, a bow stamped W.E. Hill & Sons is sold as just that: a Hill bow. However the cognoscenti search for the telltale codes which tell us which workman – Yeoman or Barnes or whoever – actually made it. So, Thomas Dodd, we know, had two people making for him: Fendt and Lott. They were apparently friends. Fendt was born in Germany in 1769. Lott was born in London seven years later, but his father had been a recent immigrant from Germany, and he might have spoken German. Fendt worked at Thomas Dodd’s place in 1798, and may have helped Lott get a job there at the same time. I’m familiar with Fendt cellos, having sold the very perfect one mentioned in an earlier blog. That had its original neck, which was Germanic in section, and had a table that was no less than 11mm thick in places. 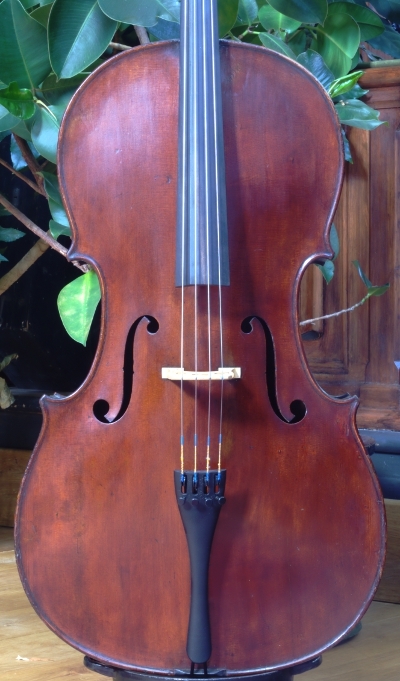 (I also have another Fendt cello for sale at the time of writing.) This is very different. It’s by John Lott, of course – not the famous violin maker and elephant trainer, but his father. John Frererick Lott senior is today best known for his cellos and basses. How should I describe the varnish? It’s that thick red-brown oil stuff that is very typical of English instruments of the period. It goes like this if it is stored rather too warmly – this commonly means in an attic. Some cellist friends referred to it as “leopard-skin”; the conventional description is the arch and evasive “advanced craquelure”, and the Hill’s just ducked the issue, writing that it was “of a somewhat thick texture.” Nonetheless the cello is one of the least interfered-with cellos of the London school and period that you will find anywhere. It sounds really wonderful, having that strong and very clear tenor sound very typical of the best English cellos. Call it blobby if you like. It’s beautiful. Sometimes violin-dealers find different instruments, and sometimes they find them irresistible. 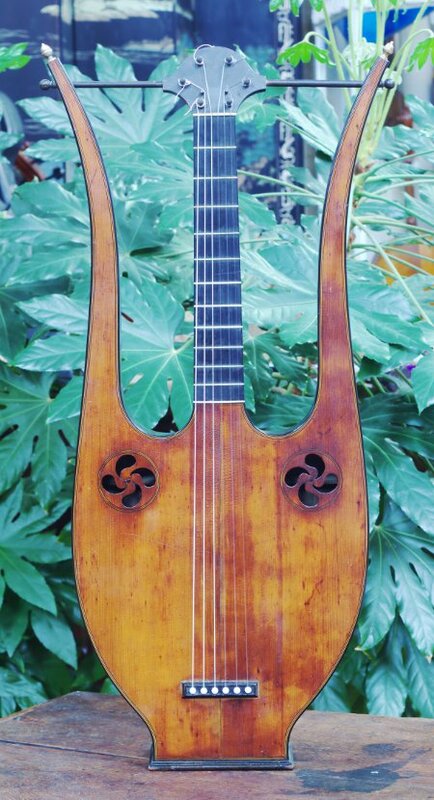 I bought this at a general auction where it was miscatalogued (a guitar in the mediaeval manner) and underestimated – but in very good condition. In the past, luthiers, that is, instrument makers, used to be far less specialised than is the case today. By the late 19th century most violin-makers made only instruments of the violin family, but Stradivari made lutes, guitars and harps too. Because his violins have become so very valuable, they have survived in some numbers, but there aren’t many of the other things left. 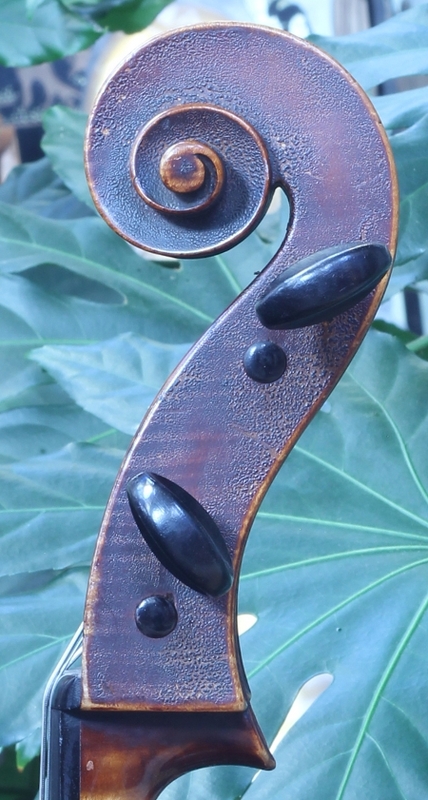 Here’s an instrument by somebody better-known as a violin maker: Blaise Mast. It has its original manuscript label inside, Blaise Mast Jeun. Mast claimed to work in Paris, but it may have come from Mirecourt, and been sold in Paris – it’s not clear. The label is undated, but it was made around 1800. It’s a lyre-guitar, and (to quote the wonderful Anthony Baines) dates from a period when ladies’ fashions extended to small musical instruments. This fashion thing . . . it’s an extension of the craze for classicism than ran through Europe rather earlier. “Classical” (the term neoclassical wasn’t invented until later) buildings sprang up all over the place during the 18th century. Classical motifs were common in paintings by 1750. Furniture (and musical instruments) were a little behind the times, but pianos and, as in this case, stringed instruments, followed the trend. It’s basically a conventional guitar, having the same number of strings and roughly the same string length. It is, however, thinly disguised as the kind of thing used by most Greek goddesses. It’s not a serious musical instrument. It has a flat base, so that it can stand upright on a table. The soundbox is a silly shape, in that it doesn’t work acoustically and in that it is most awkward to play. But no matter – it’s designed to look good, either by itself in an interior, or in the arms of a woman. The two wings are hollow, and continue the soundbox space, but are really just decorative. But look how decorative. The back is of contrasting strips of figured maple and darker mahogany, each strip being separated by a thin line of purfling. The same materials are used for the sides, each strip being carefully tapered towards the tip. Brass acorn finials adorn the ends. 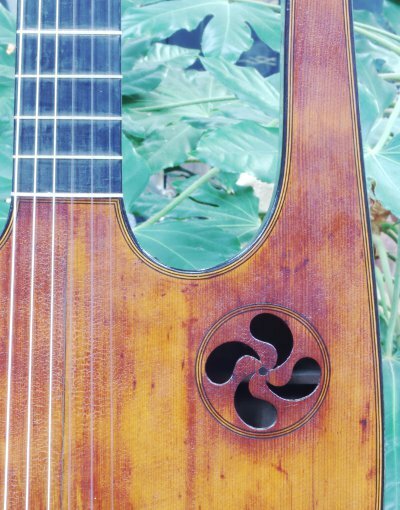 The two quatrefoil soundholes are absolutely characteristic of the period, being found also on a another lyre-guitar by Thielemann, in the Berlin Staatliches Institut collection. Sometimes life throws up weird coincidences. Having only ever seen one instrument by James Perry of Kilkenny before (a viola, back in 1986), two turn up at the same time. James Perry was probably the younger brother of the better-known Thomas Perry in Dublin. Thomas died in 1818. I don’t think it’s known when James died, but he is recorded as working in Kilkenny, about 65 miles southwest of Dublin, between 1786 and 1799. It’s very obvious that the two worked together at some stage: the models are very similar and the soundholes of both makers share the appearance of somehow having the bottoms too large for the tops. The scrolls, though, are different: James’ are noticably narrow when viewed from the front. Also James’ brand is rather unsophisticated, being large and sans serif. The first is a cello. It is both branded at the top of the back and has a manuscript label inside: Made by James Perry, Kilkenny, No. 509, 1791. Apart from the soundholes it’s very like an English cello of the period, being a touch small and having painted purfling. The body length is only fractionally less than normal at 29 1/16 in. (788mm), but it’s a rather narrow model, and the string length also is on the small side. It sounds like an English cello too – which is to say, it’s very good. The scroll is finely carved and very narrow – the ears do not protrude much. The second is a violin, but this time in largely unaltered, baroque state. It still has its original wedge-shaped fingerboard – not a replacement – and ivory top nut. 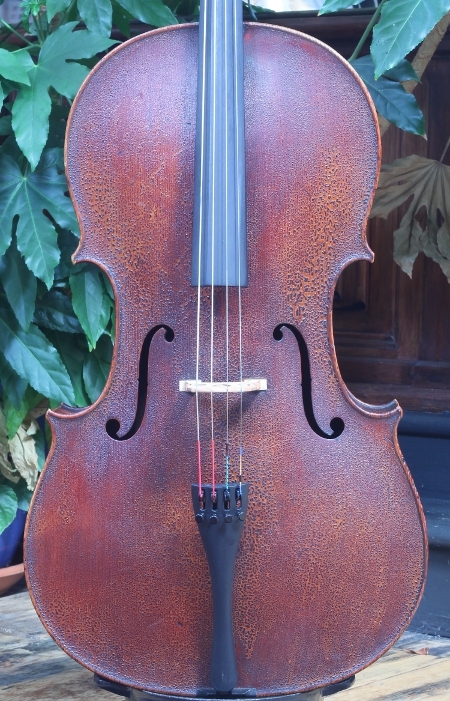 It has the same large brand at the top of the back as the cello, and also has a label in the same handwriting: Made by James Perry, Back Lane, Kilkenny, No. 137, 1783. It is nicely made, and the dimensions are normal. The back is highly arched, of course, and in one piece of good wood with a very narrow figure. The purfling is neat. An individual feature is the rather large button at the top. The ribs are all original, and match the back. The bottom rib is still in one piece. 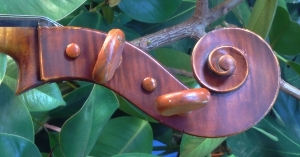 The front shows chin-wear on both sides of the tailpiece – which sadly, is a modern replacement, as are the pegs. The originals were too short and worn to be useable. Here’s a really beautiful violin. I bought it from an antique dealer. He told me it had come from a house clearance. It was in an old case together with a really nice tortoiseshell-mounted bow. The label looks completely original – somebody famous, and it’s dated 1905. So it has all the ingredients of a fake. However, we have to check. The fingerboard was very worn – actually furrowed – which means that somebody played on it a great deal before it was put away. That’s a good sign. It has glamorous wood in the back with a very wide figure, and matching wood in the ribs. The varnish is red-gold and it has rather short corners. Also it’s very neatly made, with widely chamfered, almost flat internal linings, typical of Italian workmanship. The age: well, yes, that’s about right. 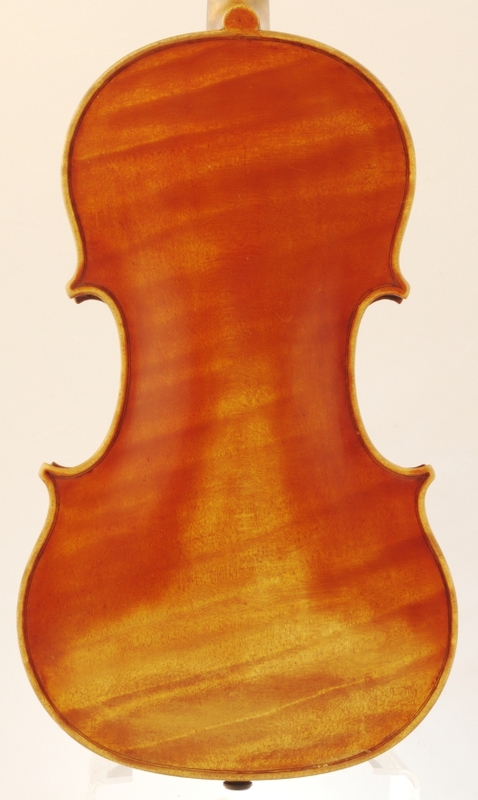 Patina is hard to copy, and the varnish wear on this violin is just that: genuine wear, not artificially aged. There are no fake scratches or rubbed areas. The button, so often overlooked by copiers, is carefully finished too . . . so far so good. A significant clue is the purfling. The black lines are really thin, the filling of the sandwich being very much thicker. Now, that’s characteristic of the maker named on the label. So is the scroll, and so are the careful edges. Now then, what next? Dendrochronology. If that shows the wood in the table dates from after the date on the label, why then of course this must be a fake. I suppose I was hoping for a date of around 1895, something like that . . . so the result astonished me. Peter Ratcliff’s unambiguous result is that the wood of the treble side dates from 1646 to 1723, and the bass side from 1651 to 1727. The wood is absolutely indistinguishable from that used by, for example, Carlo Bergonzi and Guarneri del Gesu. Had this front been on a classical violin, dendrochronology would not have been able to tell the difference. OK, now here’s what the label says: Leandro Bisiach, Milanese fece in Milano, anno 1905. I should add that the label is contemporary with the instrument – nobody’s stuck it in later. Well, did Bisiach have old violin-making wood? Yes. He was probably the only “modern Italian” maker so equipped. Here’s a rather bad photograph of two astonishing cellos. I think I might make an advertisement based on these instruments, and I’m experimenting with camera angles and so on: I’d like the final image to be good and striking. But until then this’ll have to do. One of these has had only one owner: Henry Lascelles, 2nd Earl of Harewood (1767-1841). The other, also the property of the 2nd Earl, must have been secondhand when he owned it. These instruments have been in store at Harewood House from some time before 1841. They have survived, untouched, and one of them might as well be new, for it has no significant wear at all. 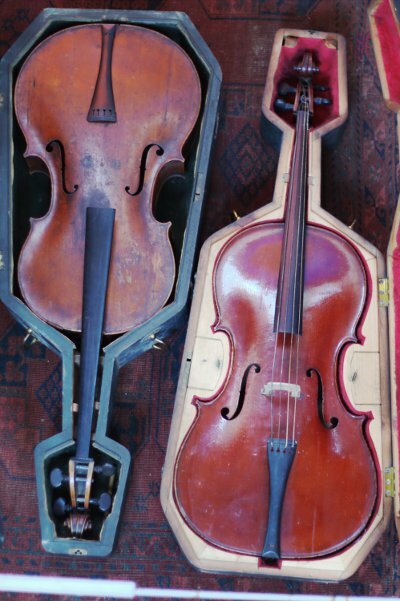 Both cellos are in their original cases (one has the Earl’s initials on a silver plaque) and both retain their original necks, fingerboards, bassbars and pegs. Neither cello has ever been fitted with a spike. I have not yet cleaned them and they are pictured in a grubby state, but I wanted to show them exactly as they were found. The one on the left, the upside-down one, dates from some time around 1755. It’s by John Johnson. It’s interesting that it was not new when the Earl first had it, but secondhand at the time. After all, even aristocrats can be cautious about spending too much on a first purchase. Its back length is 747mm, which is quite modern, but the neck is around 18mm shorter than is normal today, giving a string length of 672mm. The neck is detached from the body, but one can see that the neck angle is a little shallow, and the fingerboard is slightly wedge-shaped. It has been made in the old English way, and the neck dowel protrudes through the top block. There is a locating peg at the top and bottom of the table, but not of the back. The neck is of beech, but the head is plain maple: there is a rather odd graft, but not because the neck is later: see how it exactly fits the case. It was made that way, as many cellos were then. It has had some impact damage, and there are two cracks in the table, which were repaired in the 18th century. It might be that Henry Lascelles had an accident. It’s tempting to imagine that the Earl liked the instrument enough to purchase a new one, for the second instrument, the one with a bridge and strings, is the real find. That’s the original bridge and original strings. It has its proper label – Thomas Dodd, at the Covent Garden address, which dates it to between 1798 and 1809. It was certainly made by Bernhard Simon Fendt, who worked for Dodd at that time. It’s much the same size, with a back length of 744mm, but the neck is the same length as that in use today, and the string stop is 399mm. The fingerboard is still noticeably wedge-shaped, though. It has had very little use and is in perfect condition: it is, after all, only secondhand. The varnish is almost unworn. That’s not a crack in the lower bouts – it seems to be a run of coffee, or maybe chocolate. Now, I’m in a state of shock about these. I’ve never seen such perfect cellos dating from this period. Of course I’d prefer to keep them in their present state, with their flush necks and so on – they’re real museum exhibits. But I’m a dealer and I can’t afford to keep them myself. Therefore I’m going to try my best to sell them with their small bassbars, just as they are: I don’t want to be accused of cultural vandalism. But if they remain unsold I’ll have no option except to make them ready for modern usage – because then they’ll certainly find buyers very quickly.